Step 2 : Disable all repos except the fusion repo and update ! I haven't had the time to explore at depth, but the most striking new addition is the cylinder effect. It certainly beats the boring cube. I also noticed that cube atlantis has got coloured fish now (Hard to see in the screenshot). 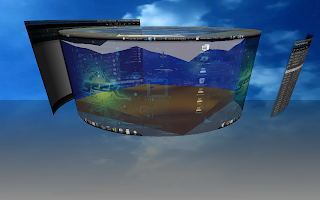 As always, compiz-fusion rocks !